A sinister force, long thought destroyed, stirs in the land. As a she-demon bent on wreaking worldwide havoc struggles to escape her prison and a foul demigod plots to bend her to his will, a band of desperate heroes must infiltrate the very heart of darkness in a daring attempt to stop them both. good version of a classic module. Having played the module as well as played the RPG game, this brought back fond memories and the voice acting and production values were really good. Strongly recommend. couldn't put it down. audible version is awesome. loved the voices he does and he brings emotions out with greatness. While the adventure path is a classic, this book is rather boorish and uninspired. The actual performance/reading is acceptable. The issue is really more the author's lack of literary flare. The words are just dry when sentences are so similar in length and structure. The lack of a more colorful vocabulary probably would lend itself more towards young readers/listeners, but surely it must still seem a bit dull and unchallenging even then. Would you try another book from Thomas M. Reid and/or Bernard Setaro Clark? I would not try another book from Thomas M. Reid. This books was really boring. The romance put into the storyline was really bad. Main character seemed weak. Would you ever listen to anything by Thomas M. Reid again? Which character – as performed by Bernard Setaro Clark – was your favorite? 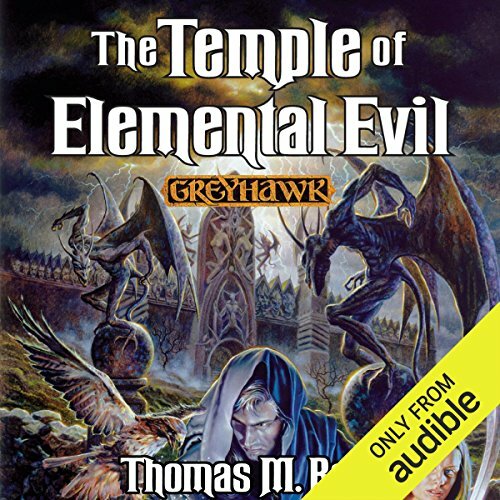 Was The Temple of Elemental Evil worth the listening time? NO. Skip book 3. It has nothing to do with the first two. Skip this book and go straight to book 4. You will be happy you did. Love this series, but quite a change from Paul Kidd's engaging storytelling. Just couldn't get into this writer's style of writing. A little too much detail where I didn't expect, and the converse elsewhere. What was most disappointing about Thomas M. Reid’s story? The action scenes read like a play-by-play rather than a flowing narrative. This guy is an incredible narrator. I have no idea what was wrong with this book or the narrator. I was so bored out of my mind I fell asleep a few times. I kept thinking maybe it will get better towards the end but it didn't. It had such great potential but it fell so bad. I forced myself to finish listening to the story because I was so invested into it. But maybe the next listener will enjoy it but I however did not. A good interpretation of the classic module. I was pleasantly surprised how good the narrator was and the story plays out like a D&D adventure. The only thing I didnt care for was some detail regarding the temple was ignored, but given the size and complexity of the source material the author still did a good job. As a player who picked this game up in the 70s, I am familiar with this mod. It was never one of my favorite, and now the story proves that idea. It was simply a bit dry as a story. The writing was a bit cliche as it played out. Sort of like a bunch of old fantasy tales pieced into this one story to make the complete tale. There just wasn't anything that made me sink into the story. The saving grace came from Mr. Clark's voice work. This is the first I have listened to with Mr. Clark as the narrator. He did a good job and maintained different inflections and accents for the different characters pretty well. The book is entertaining and somewhat engaging. It follows a group of adventurer's (heroes of a sort) attempting to destroy an evil temple near the kindly village of Hommlet. It is a quick read based upon an almost universally well regarded fantasy roleplaying game adventure series (T1-4 The Temple of Elemental Evil, produced for use with the Advanced Dungeons & Dragons RPG). That is a work I know pretty well and many of the characters in the book felt familiar to me (e.g. Elmo, the druids, Bern, Zert, and most of the townsfolk). The locations have a familiar ring as well (e.g. the villages of Hommlet and Nulb, and the moathouse and temple itself), and the main sources of evil (Iuz, Lolth, and Zuggtmoy) are the expected ones. In other words, the book hewed pretty close to original source material in several ways - enough to make them feel known to me. Having said that, I did wish for more character development through the book - there was almost none at all, making several of the characters feel very flat throughout. Even so, a player of D&D could easily pick out the different character classes represented by each main character, even if the author didn't include the characters calling each other druid, knight, or wizard occasionally. In fact, referring to a character by their class is something I usually dislike quite a bit, but it wasn't so intrusive in this book. The writing and story are mediocre - neither exceptionally poor nor exceptionally well done. I knew going into this that it wouldn't be the most fantastic work of literature I have ever had the pleasure of laying my eyes upon. I did enjoy it as a quick read and entertaining diversion. It hit the right notes for a fantasy novel based on a well known D&D property. I recommend it to anyone who will feel the tug of nostalgia when listening to a story about Hommlet, Iuz, and the Temple itself (and to learn the fate of Elmo). I do not recommend it for someone looking for a fantastically written epic heroes' tale with rich language, explanations about the magical universe, or extremely well thought out characterizations. 3 solid stars for the enjoy-ability and nostalgia. What would have made The Temple of Elemental Evil better? What could Thomas M. Reid have done to make this a more enjoyable book for you? A great start, well narrated to a point. The setup to this adventure is good; it ticks many a box of old world fantasy and is narrated brilliantly by Bernard of whom I am now a fan. However, the story becomes lost and forever ongoing where even the narrator becomes mediocre because of the ongoing story. The female character starts well but soon becomes a stereo type old fantasy weak heroine which contradicts her start. The characters become lost within the story / and then story telling which is a polar opposite from the build up. Shame. It could have been a truly epic adventure.